You may have heard how eating red/purple/blue fruit can improve your health. Most focus has been on cherries, black grapes (and, therefore, red wine) and a range of berries. Health benefits have been ascribed to the antioxidant properties of the anthocyanin pigments that they contain. But let’s not forget that there are also many other fruit and veggies that contain anthocyanins and other health-promoting pigments such as betacyanins and carotenes and that many are easy to grow. The list of fruit containing these compounds is long. It includes cranberries, bilberries, red and black raspberries, blackberries, black and red currants, mulberries, elderberries, most of the cane berries like loganberries and jostaberries, blood oranges and purple olives. While the common tomato does not produce anthocyanins, purple tomatoes do. The red/purple colour in onions, purple corn, purple potatoes and carrots and eggplant skins is also due to anthocyanin. The antioxidant properties of anthocyanins mean that they can scavenge forms of oxygen and nitrogen called free radicals which can damage lipids, proteins and DNA and, thereby, are helpful in several disease states. There has been much debate about whether these health benefits are due to their anthocyanin content or to other components of a diet which includes them i.e. one rich in fruit and vegetables. There are also questions about whether effects observed in animal studies or in human or animal cell lines in test tubes apply to anthocyanins in the diet. However, in studies where humans are given concentrates of anthocyanins from fruit or eat a lot of the foods containing them, there is evidence of reduced inflammation and protection from cardiovascular disease. In other diseases such as diabetes, obesity, cancer and declining vision with ageing, evidence from test tube experiments or from animal studies is conflicting and there is no clear support of benefits to humans. Quite a few leafy vegetables also contain anthocyanins. 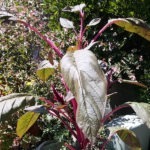 Most of us are familiar with red lettuce, both curly-leaved and cos forms, and with red cabbage. However, there are other less common examples which are all easy to grow. A member of the Brassica rapa Chinensis group (pictured in the banner image), it is a hybrid of the more common bok-choy, with red-purple infused through the leaves. Grow it as you would bok-choy i.e. it prefers the cooler months, so plant in early spring or late summer/early autumn in a moist, sunny position. Use leaves and stalks in stir-fries, or baby leaves in salads. The flavor is a little spicier than the green version. 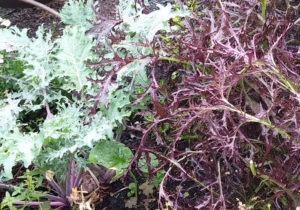 Among the many varieties of kale, the red stems and veins of this type (Brassica napus subsp. pabularia) contain anthocyanin. Fairly resistant to disease and able to adapt to different growing conditions, it is best planted in autumn and grown as a winter vegetable in a sunny spot, but can be grown in summer if given some shade. 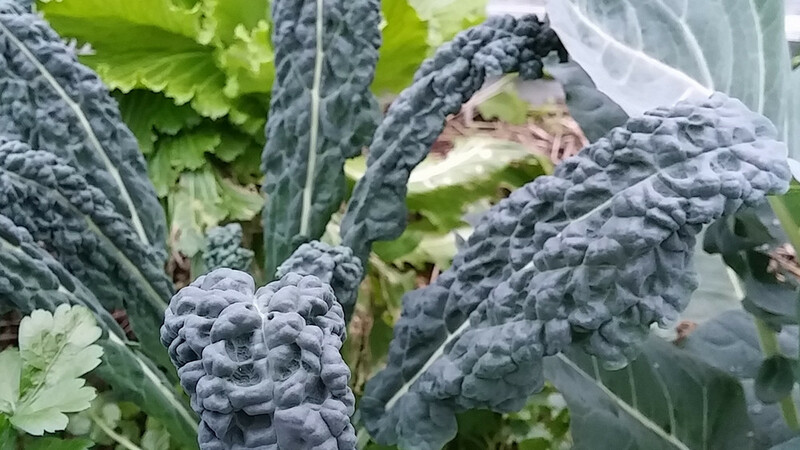 Like other Brassicas it prefers moist well-drained soil. Harvest the outside leaves and the new leaves in the centre will grow and the plant remains productive for many months. Flavour varies with soil and temperatures, but can be eaten at any time. The stems can be tough so use the leaves. They are best sautéed in olive oil or steamed. The fine-leaved red mizuna Brassica rapa nipponosica is a pretty vegetable. Like other Brassicas, it is best grown in the cooler months. It refers partial shade and keeps on producing if you harvest the outer leaves. Its tender, mildly spicy leaves and stems are best in salads, but can be added to stir-fries. Although technically not a leafy green since we don’t eat the leaves because they are poisonous, the rich red stalks of Rheum rhabarbarum stalks are edible. Rhubarb has the advantage of being a perennial vegetable. Plant crowns in spring, keep moist – but it will survive short dry periods, avoid harvesting until the second year of growth and remove any flower stalks. It can be divided in late autumn or winter to create new plants. 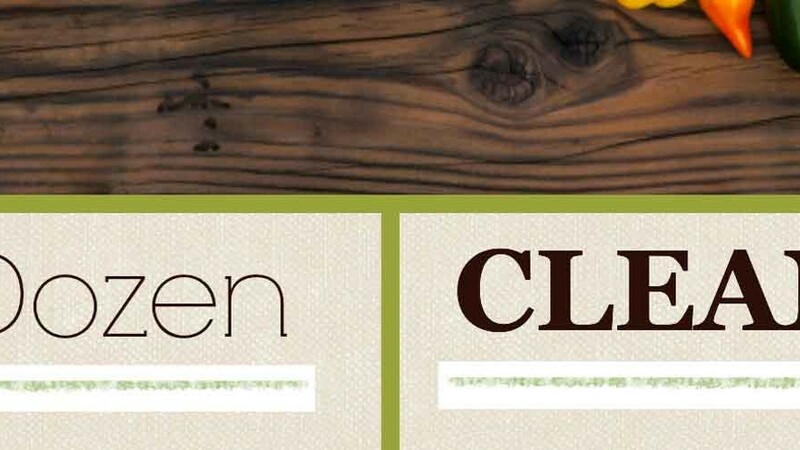 Harvest stalks that are about finger thick – greater thickness results in stringiness. Cooking is essential. Boil or steam with something sweet such as apples or pears. It’s very good added to apple crumble as it adds zing and richness. These stunning plants, Brassica juncea var. rugosa, are related to turnips, broccoli and cabbage. A cool season crop, best planted in late summer or autumn to early spring, it is very hardy, not requiring much special care. Leaves are mottled purple on top and green underneath. When young, they are tangy and spicy – with greater maturity they become quite hot and a little bitter. Use in salads with a flavoursome dressing or in stir-fries. Anthocyanins are not the only cause of red colour in fruit and vegetables. Betacyanins, members of the betalain family, are distinct from anthocyanins and the two pigments are not found in the same plants together. Betacyanins also have anti-oxidant and anti-inflammatory properties which contribute to health. 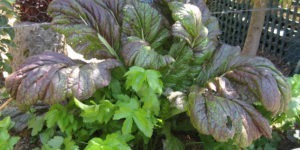 This leafy vegetable is a member of the same family a spinach and silver beet. Growing and harvesting details are here. 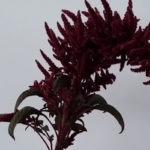 The large number of Amaranthus species consists of very striking, attractive plants producing many flower stalks which, if left to mature, provide a gluten-free grain, rich in iron, manganese, magnesium and selenium. It provided a staple crop for Aztecs and is now most frequently grown for its seeds in South America, Mexico, Nepal, India and China. Reaching nearly more than 1 ½ metres in height, it is very easy to grow, so much so that it may be regarded as a weed because of its prolific seed production. There are many species, 4 or 5 of which are grown for their leaves. New growth, stems and flower heads are a deep red. Leaves tend to be greenish on top but red underneath. Resistant to heat and drought, sow in mid-spring. Use the leaves in stir-fries or cook as you would spinach – younger leaves and stalks are more tender. 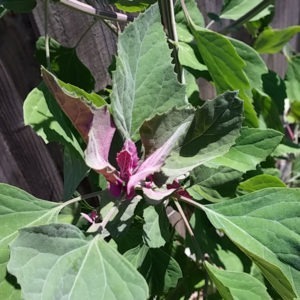 Also known as Giant Lambsquarters or Purple Goosefoot, Chenopodium giganteum is a rather uncommon vegetable. Like amaranth is makes a stately addition to your garden, often reaching 2 metres in height. Young growth is red with a pinkish “dust” on its surface. More mature leaves are red underneath and green on top. It is easy to grow. Sow in spring in either full sun or partial shade. It should be cut down before flowering to avoid unwanted seed spread. It has a high protein content and is rich in vitamins C and E, calcium and iron. Like rhubarb, it contains oxalic acid, so preferably it should only be eaten when cooked using a steel, not aluminium pan. Its flavor is similar to spinach. However, some people blend the raw leaves to make smoothies. If you do this, it is wise to make this an infrequent event. These compounds give red and orange colour to some fruits and vegetables and, notably, carotene is the orange pigment of carrots from which its name derives. Carotenoids are found in a wide variety of vegetables, not just those that are orange or red like mangoes, melons, pumpkins, apricots, peaches etc. One of the carotenoids, lycopene, is present in significant concentrations in tomatoes, watermelon, pink grapefruit and guava. Many other vegetables which are green rather than orange, such as lettuce and spinach, are also rich in this compound. Β-carotene is the precursor of Vitamin A, and, like lycopene it is important in the health ofr the immune system, eyes, skin, mucous membranes and certain forms of cancer. Given the range of natural pigments in so many fruit and veggies and the many different health benefits reported, it is most likely that eating a large variety of these foods is the way to go. Since many of them are easy to grow, why not get started now?